"Captives and Captors" is now available for pre-order! A distraught father kidnaps and tortures the man suspected of abducting his adolescent daughter. An off-duty detective and a family friend attempt to find a missing girl in a web of lies. A hard-edged young woman searches for her missing boyfriend and discovers a heinous plot for vengeance... The stories seamlessly interlink to deliver one shocking tale of violence and revenge. 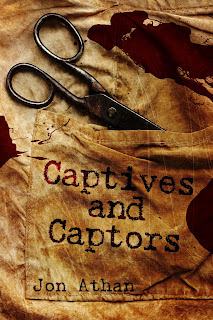 Today, I am proud to announce my next horror/thriller book, Captives and Captors. This disturbing novel blends the suspense and mystery of an unnerving thriller with the dread and violence of an extreme horror book. It asks a simple question: how far would you go to save a loved one? You'll be able to answer that question on August 10th, 2016 when the book officially releases on Amazon. You can pre-order it now for $2.99 or you can save it in your wishlist and read it through your Kindle Unlimited Subscription when it releases. Regardless, I hope you enjoy this grisly novel. I've been very busy these past few days. Unfortunately, I forgot to inform you about my ongoing sale! I have three books on sale for a few more days. You can find the exact time remaining for each deal on the respective book page. All of the deals end at the same time, too. Essentially, if you buy them all, you're getting three books for the price of one. That's a pretty solid deal if you ask me. Regardless, thanks for your interest and enjoy! Writing Updates for June 2016! Hello! Butcher Road released on June 11th. I want to thank everyone who supported the book. Whether you bought it or read it for free through Kindle Unlimited, thank you for your support. Your readership is truly invaluable. For the past few months, it has helped me overcome writer's block multiple times. It has given me the opportunity to proceed with my work, despite the lingering pessimism. You didn't come here for a sappy 'thank you,' though. You came here for writing updates, right? Well, let's get to them. A Family of Violence is still set to release on July 11th, 2016. It is a violent horror book with a few provocative themes. It revolves around a minor, so it might not be for everyone. Read at your own discretion. I also finished the second draft for a horror/thriller novel set to release in August. I'll be announcing it very soon, so please keep an eye on this website, my Facebook, or my Twitter. I'm currently writing the second draft of a sci-fi/fantasy novel. This is my first novel in the genre, so I've been very anxious about this project. I had a lot of fun writing it and I'm having more fun re-writing it. It's an action book about psychic powers, a rebellious teenager, a corrupt government, and World War III. It's already the longest book I've ever written. You can expect a full announcement sometime next month. I have plenty of books planned for the next 9 months or so. I just finished writing the first draft for a body horror novel. While I let it rest at the back of mind, I'm planning a new novel. I'm a bit stumped, though. I have an idea for another extreme horror novel, but I have the urge to write another fantasy story. I will be outlining something over the next few days/weeks. That's all I know for certain. Anyway, thank you for reading. I'll have more updates soon and all that good stuff. Also, look out for a sale on some of my books later this week.